NORTHEAST Victoria is a great place to get good food. I discovered two great places to eat on a recent trip there, the first in the town of Milawa. Brown Brothers is a winery which has a restaurant as well, the Brown Brothers Epicurean Centre. 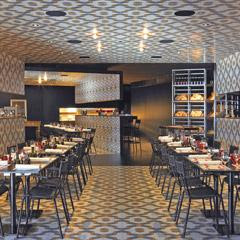 The restaurant makes it a real food and wine destination. After we sat down, I was served the best apple juice I've ever had. It was from the nearby town of Beechworth. Then the food arrived. For the entree we had several small dishes, the first being prawns in brik pastry with braised chorizo. The prawns tasted very good and the braised chorizo added to it and made it even better. Next we had duck salami which had great flavour, followed by venison tartare. This was probably my least favourite of the starters because I'm not a huge fan of raw meat. For the mains, Dad and I ordered roast duck and braised duck leg, plus prime sirloin with a red wine jus. The roast duck was quite nice but it was a bit tough, and the braised duck leg was similar but also tough. I didn't have much of the steak but I wish I had because it was beautifully cooked. 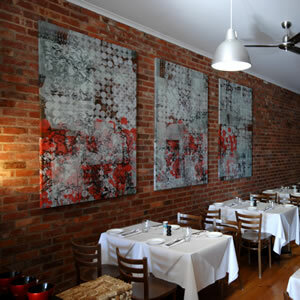 The second place we ate at was Wardens Food & Wine and it's in Ford St, Beechworth (pictured above). In my opinion, this is a one of the best restaurants in Victoria. To start with I ordered saffron gnocchi, which tasted great. The saffron taste was not overpowering. My dad had king prawns with a spiced pork polpette. He said it was great which is a bit bad considering I didn't get to try any of it. For the main meal we ordered loin of lamb with a roasted garlic sauce and a grain-fed porterhouse steak with a caramelised onion sauce. The lamb was beautifully cooked and the sauce was magnificent - that garlic was great. Next I tried the porterhouse steak which again was beautifully cooked and once again the sauce was great. The beef was just better than the lamb in my opinion. Wardens is a great restaurant and in my opinion could soon be better than other great Victorian restaurants such as The Royal Mail Hotel in Dunkeld. I HADN’T been to Pure South for a long time so I thought it was time for a return trip. My dad had gone there about a week before and said it was a lot better since last time. When we arrived we were given some fresh bread with butter. The fresh bread was very nice but the butter was very strong. For the entrées we didn’t share so I ordered Seafood Linguine to myself. Before my entree arrived we were given a beetroot and goat’s cheese appetiser which looked fantastic. I’m not a fan of goat’s cheese, but I discovered the beetroot had a very nice taste. The Seafood Linguine came next and there was a huge variety of seafood on the plate including fish, mussels, squid and clams. I tried the clams first - I’ve never eaten clams before and I thought they would be like mussels which I don’t like. But I was wrong, they tasted great and were one of the best things in the dish. The squid and fish were also both very good. The mussels didn’t taste that nice but were cooked well. For the mains we all shared Braised Beef Cheek with Onion risotto, a pork belly dish and a big steak. The best dish of the day by far was the Braised Beef Cheek. It was the best dish I’ve ever had at Pure South. The beef could be cut by a spoon and tasted great and the onion risotto was perfect. Next I tried the pork belly – it was a bit of a disappointment. The pork was fine, but there were heaps of other unnecessary elements on the plate. Finally I had the steak. Pure South steaks are some of the best in Melbourne in my opinion and I wasn’t let down. It was perfectly cooked, but it would have been way better if it had a garlic butter or something like that. So Pure South was well worth a return visit and I probably will be going back there soon. Badger's Brook Estate, 874 Maroondah Hwy, Coldstream. Ph: 5962 6161. Last month I ate my first degustation meal at Bella Vedere Cucina near Coldstream. We arrived there on time at 7.20pm and we smelt garlic as we walked in, a great sign because I love garlic. On the table were heads of garlic and some fresh bread. For a starter we were given garlic croquettes. They tasted great. The garlic was strong without being too overpowering. Then there was a long wait for the first real course of the night, but it wasn’t the restaurant’s fault. It was because a group of loud, annoying women arrived so late. Anyway, the chefs came out and introduced the courses. We would be having a garlic broth, garlic rabbit, octopus with a grand aioli (which contains 200 cloves of garlic), goat’s cheese soufflé and red fruit and white fruit sorbet with a hint of garlic. First came the garlic broth. I wasn’t sure I liked it that much. The garlic wasn’t strong enough and it was way too watery for me. Second came the garlic rabbit. It was by far the best dish of the night. The rabbit was beautifully cooked and the garlic went brilliantly with the meat. Third came the main course - the octopus and the grand aioli. I liked the octopus but I’m not sure it went too well with grand aioli. The grand aioli was so strong that you could only take little bits on your finger and lick it. If you were to smother it on the octopus it would be enough to knock you out. After another long wait the chef, Gary Cooper, called me over (as he had said he would earlier) to the kitchen. There I helped plate up the goat’s cheese soufflé. It was quite a good experience. The kitchen was very relaxed and there wasn’t any pressure or shouting. After I’d finished the goat’s cheese soufflé one of the chefs said he would take me to see some mudcrabs they would be using the following day.. The fourth course was the goat’s cheese soufflé. I am no fan of cheese but I still tried it. I didn’t like it very much, mostly because of the cheese factor. I think it was technically correct but it wasn’t my favourite dish. I was drifting in and out of sleep as another wait for the fifth course, which was the sorbets, followed. Then, at 11.10pm, tired and exhausted, it was time to leave. We had spent almost four hours at the restaurant – not really what I’m used to. The highlight of the meal was definitely the rabbit and all of the chefs’ kindness to me. Overall I prefer ordering off the menu and I don’t think I would go to a degustation again. It’s more of an adult thing. But I would be interested in returning to Bella Vedere on an order-off-the-menu day. I’ve made an amazing discovery. It’s great, it’s not too expensive and it’s not too complicated. When I walked into the restaurant it reminded me straight away of some of the restaurants I went to in Italy, everything from the friendly service to the Italian mum in the kitchen. We ordered Ravioli al Borolo (Duck Ravioli in a red wine sauce) for the entrée, Roast Goat with Potatoes, and Seafood Platter which had prawns, flathead, calamari, sardines and crab cakes for the mains. We wanted to order more but we were assured by the friendly restaurant owner that we had ordered enough. We were served some bread with garlic-infused olive oil and balsamic vinegar. I don’t usually dip my bread in oil but since it had garlic in it I just had to. It tasted great and it’s a pity there wasn’t more bread to mop up the rest of the oil. We got more bread later though. The duck ravioli arrived next. It tasted great. The red wine sauce wasn’t too strong and the pasta was perfectly cooked and was homemade which made it even better. The mains came next. I tried the goat first. It was some of the best meat I’ve ever tasted. It was really good and fell of the bone. The goat had a really tasty jus and it didn’t overpower the flavour of the goat. Next I tried the seafood platter … everything was good. The calamari was well cooked, as were the prawns and the flathead. I’d never tried crab cake before so I was curious to see what it tasted like. I enjoyed the taste. I tried the sardines next _ but their flavour was a little bit too strong for me. We were told about some of the desserts including Raspberry Pannacotta and Chocolate Mousse by the owner’s wife but unfortunately I was too full to eat anything else. It was one of the best Italian meals I’ve had in Melbourne, in fact I preferred it to Tutto Bene. It was one of the best meals I’ve had in a long time. And the bill was a modest $80.50! 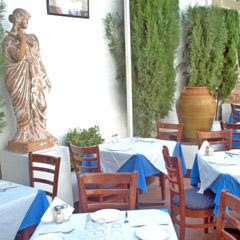 I’ve never been to a restaurant with no menu so I was very interested to see what Jim’s Greek Tavern would be like. Since it’s very hard not to love Greek food, it wasn’t that worrying to me that there was no menu. Soon after we arrived at Jim’s Greek Tavern we were given saganaki, grilled octopus and bread with dips. I tried the bread first and it was some of the best bread I have ever tasted. The fact that it was fresh out of the oven and was still warm made it even better. Next I tried the octopus. It was very nice and wasn’t too chewy. I didn’t try the saganaki because I’m not a fan of cheese, but Mum and Dad thought it was pretty good. Next we were given lamb yiros, lamb skewers and snapper with chips. I had the lamb skewers first and they were really good. The lamb was so tender. Next I tried the yiros. It was also very nice and it was in easy-to-eat bit-sized pieces. So soft and tender and some tasty crunchy bits. I had the snapper next. It was soft and delicious but it had quite a few bones in it. We ordered some baklava for dessert, but I was so full I couldn’t eat another thing. WITH many Italian restaurants, there is so much good food on the menu, it's all so hard to choose. Do you have the seafood risotto or the spaghetti bolognaise? A great example of this is Giuseppe Arnaldo and Sons at Crown Casino. So we went there for lunch one Saturday and when we got there we were welcomed by our friendly waiter and were given the menu. We didn't book because you can't here. The menu had so much good-sounding food on it, but in the end we ordered Veal, Pork and Mortadella Meatballs with Lemon and Celery salad, and Oregano Dusted Shrimp with Lemon Aioli for the entrees. For the mains we ordered Mezzi Rigatoni which is rigatoni with pork sausages, sage tomato, garlic and chilli. We also had the Coral Trout Risotto and the Grass-fed Sirloin. Not long after we'd ordered, the entrees arrived. I first tried the Oregano Shrimp _ little prawns still in their shells which you eat whole. It was good but if I came back I don't think I'd order it again. Next I tried the meatballs: they were the best meatballs ever. They melted in your mouth and the flavours were all so good. After a good wait the mains arrived. I tried the risotto first. It was so good. I think risotto is now starting to become my favourite Italian food. Next I tried the steak. It was cooked perfectly and was very good, probably tied with Rockpool for best steak in Melbourne in my opinion. The pasta was also very good and you could tell it was homemade. Though it wasn't the best main, it still beat anything you get in a cafe by a long shot. We were offered dessert by our friendly waiter, but we'd had enough. Instead, we went to see the movie Julie and Julia. It's a pity that the movie was nowhere near as good as the food we had just experienced. OK, OK. We've conceded defeat. kate and zoe are officially passing the food blogging baton to our fantastic mate, James. This food-loving 11-year-old from Northcote has showed both of us up over the past few months blogging on MoVida, Bistro Guillaume and restaurant-of-the-moment (though not in his opinion...) Coda. We just love his stuff so - though we may pop our heads back in from time to time - from now on, kate and zoe is all about James. We hope you enjoy his thoughts as much as we do. IN THE heart of Doncaster Shoppingtown is a nice Greek eatery with a great view. Mum, Dad and I have been to Kouzina in Southbank and it's really good food. When we arrived at the Doncaster Kouzina, we ordered some warm pita bread with tzatziki, lamb lady fingers and beef and lamb keftedes, which is a Greek-style chargrilled meatball. First came the pita bread with a huge dollop of tzatziki but only four pieces of pita bread. The amount of pita bread compared with the tzatziki was a bit silly, so we had to order some more pita bread. The bread was thick and fluffy, and it tasted nice and warm and went very well with the tzatziki. Next came the lamb lady fingers - filo pastry rolls filled with lamb and spices. I didn't have them (I've tried them before but didn't like them), but Dad said they tasted really nice but were way too hot. He even said he burnt his mouth. Next came the beef and lamb keftedes. They tasted very nice and went very nicely with the tzatziki they were served with. After a very short wait (too short in my opinion), the mains arrived. We had ordered T-bone brizola, prawn saganaki and lemon lamb. I tried the steak first. It tasted quite nice but it was a bit dry and overcooked. Next, after some persuasion, I tried the prawn saganaki (I'm not a fan of feta cheese or cheese in general, so I wasn't that keen on it). But the tomato sauce, which contained chilli, spanakorizo and cinnamon, tasted really good and I would have it again. Finally I tried the lamb. In my opinion it was the best dish of the day. A good tasty sauce with lovely melt-in-your-mouth slow-cooked lamb is pretty hard to beat. Overall a good meal, but service could be slowed down a bit. The views of Melbourne from the restaurant are good, but it's a bit of a shame it has to be in a shopping centre rather than by itself. 10: Crack open the bubbly. We've found perfection. 8-9: We're definitely making this a regular haunt. 6-7: Worth a return visit but it doesn't totally rock our boat. 4-5: Only an option in emergencies. 1-3: Don't waste your time. Haven't you noticed that food all by itself is really boring to read about? It's everything around the food that makes it interesting: the sociology, the politics, the history. "One of the delights of life is eating with friends; second to that is talking about eating. And, for an unsurpassed double whammy, there is talking about eating while you are eating with friends."